Bring vs. Take: What’s the Difference? Home » Bring vs. Take: What’s the Difference? If your fiancé is in the kitchen and you’d like him to get some wine from the refrigerator for you, how would you ask? Later, if you’d like your fiancé to return the wine to the refrigerator without you having to leave your spot on the couch, how would you ask him to do that? Most Americans would say “Would you bring me some wine?” and “Take this wine back to the kitchen, please,” respectively. Notice, however, that these questions use different verbs to describe nearly identical actions. The distinction hinges on usage patterns, rather than on strict grammatical rules. If these rules seem confusing or unclear, continue reading to learn more. What is the Difference Between Bring and Take? In this article, I will compare bring vs. take. I will use each word in a sentence to illustrate its proper context, and, I will give you a helpful trick to use when you can’t decide whether bring or take is appropriate for your writing. What does bring mean? Bring is a verb that means to carry along with you. Like take, it can be literal or figurative. Don’t bring bean dip to the party, because nine other people already did. Bring Hannah with you when you come! If you don’t quite see the distinction between bring and take, let’s take a closer look. Bring suggests motion toward the speaker or writer. Take suggests motion away from the speaker or writer. This is why our beginning examples are phrased the way they are. You would ask your fiancé to bring you a bottle of wine and then take it way when you are done with it. What does take mean? Take is a verb that means to carry away with you. It can be used literally to refer to physical objects or figuratively in a variety of contexts. Take this small gift as a token of my appreciation. Nori needs you to take her to the airport tomorrow morning. Take is sometimes a synonym for use, like in the examples below. Drilling each hole separately would take too long. Take 33rd Street to Hawthorne and turn left. These examples are somewhat abstract. In the first sentence, drilling the holes separately could be said to use too much time. In the second example, the driver will use 33rd street to get to Hawthorne, at which point she will turn left. Here is a helpful tip to remember take vs. bring. 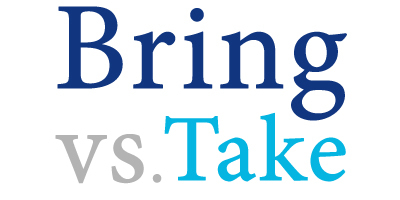 Take and bring are verbs with very similar meanings. In situations where they both mean to carry something, they are differentiated by context, specifically, the implied direction of travel. For instances when someone will be moving away from the speaker or a specified point, use take. For situations when a person will be moving toward the speaker or a specified point, bring is more appropriate. Is it bring or take? Bring and take are verbs that mean to carry something, but they have slightly different uses. In situations when the direction of travel is toward the speaker, bring is the correct word. In situations when the direction of travel is away from the speaker, the correct word is take. If you aren’t sure whether you should use take or bring, remember the phrase “take it away.” This trick should help you remember that take is the better verb when someone is carrying something away from you. 1 What is the Difference Between Bring and Take? Aural vs. Oral: What’s the Difference? Diner vs. Dinner: What’s the Difference?